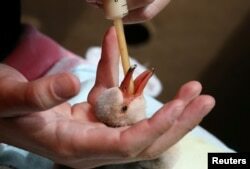 A rescued lesser flamingo chick is treated by officials after being moved from a dam in the Northern Cape province to the SANCCOB rehabilitation center in Cape Town, South Africa Jan. 30, 2019. "There are still several thousand birds breeding in the dam in areas that still have water," said Katta Ludynia, research manager at the Southern African Foundation for the Conservation of Coastal Birds (SANCCOB). "It now depends on the water levels whether these birds will pull through." "The dam in Kimberley is so important because it is manageable, so we can secure the water level there. That might be the only site the flamingos can breed in southern Africa, if the drought continues in other areas," Ludynia said.